Main Street Gazette: Places, everybody! And ... Action! 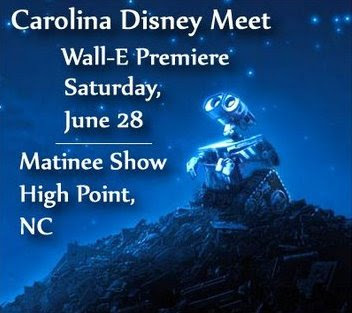 In case you’ve been living in outer space for the past 700 years, there’s a little film called WALL-E coming out this Friday, and in case you haven’t heard there is a little get together for the film in North Carolina on Saturday, sponsored by brothers George and Andrew of Imaginerding and Jeff of 2719 Hyperion. I also hear that Brian, of Mousin’ It Up, will be in attendance along with yours truly. The picture below sums it up pretty well, but should you have any further questions be sure to check with George. Ryan, did I hear you say you were buying popcorn for everyone! I am afraid Ryan's grant application to the Obsession Foundation was denied. Simply because Doc is here and you all are there. Have a great time! Well, I figured it was the least I could do George, considering I was told that you were having Dole Whips flown in for everyone. Oh, wait, was that a secret? Doc, you know you'll be there in spirit. Besides, Disney is only a few double digit dreams away now! If George is buying popcorn then I'm flying down for it. As a fellow North Carolinian (now living in Michigan), I wish I could be there!